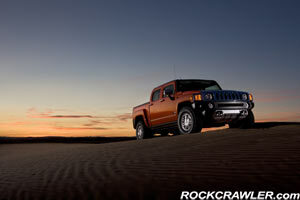 CHICAGO – HUMMER is bringing its unmistakable style and unmatched capability to the truck market with the 2009 H3T. It is based on the architecture of the popular H3, but features a five-passenger crew cab and a separate five-foot-long (1.5 meters) bed. In addition to its segment-defying size, the H3T also stands apart from other trucks with its signature HUMMER off-road capability. 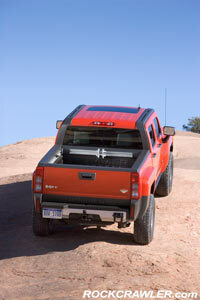 It is the only midsize truck to come standard with full-time four-wheel drive, 32-inch tires and functional skid shields. It also is the only midsize truck to offer front and rear locking differentials, as well as 33-inch tires – and the V-8-powered H3T Alpha can tow up to 5,900 pounds (2,676 kg). 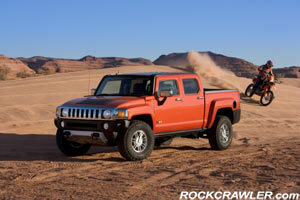 The H3T is offered in four trim levels, including five-cylinder models and the popular, V-8-powered H3T Alpha edition. Production is scheduled to begin in the third quarter of 2008 at GM’s Shreveport, La., assembly plant, with vehicles arriving at HUMMER dealerships shortly thereafter. 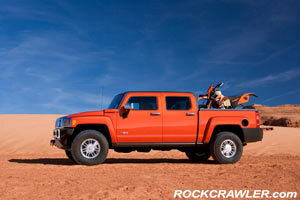 HUMMER will sell the H3T in North America, Europe and the Middle East. Like all HUMMER models, the H3T has a purposeful design, consistent and iconic styling cues, including a wide, aggressive stance; a low roofline and high beltline; and large, off-road tires. 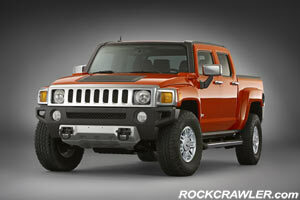 The wide, seven-slot grille and round headlamps mounted in square housings are signature HUMMER design elements. 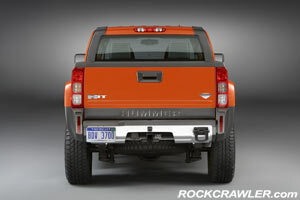 The crew cab body shares H3 styling and components from the B-pillar forward, while the rear section of the cab and the separate bed are unique to the H3T. 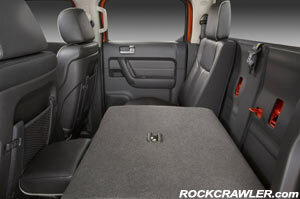 The five-foot bed is similar in design and function to GM’s recently redesigned full-size trucks, including an easily removable tailgate and provisions for a bed-rail accessory system. A full-size spare tire is mounted beneath the bed. The bed is sized to carry a wide range of popular outdoor necessities, from hauling motocross bikes to Baja, a quad to camp or backcountry gear to the trailhead. One of the industry’s largest portfolios of accessories complements the H3T’s bed, offering different cargo management options to complement all of those lifestyle interests. In addition to the factory-developed accessory portfolio, HUMMER has partnered with top automotive aftermarket companies to develop more than 50 Officially Licensed HUMMER Accessories – a first for the brand. 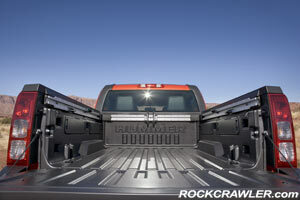 A variety of exterior enhancements, such as a Slant Back Bed Cover, hard tonneau covers and a winch are offered, along with cargo management solutions such as the BedSlide and bed divider, offering countless possibilities to personalize the H3T. 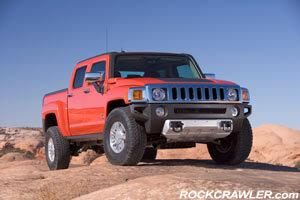 Standard in the H3T is the Vortec 3.7L I-5 with dual overhead cams and variable valve timing. This inline five-cylinder engine offers an excellent combination of power and efficiency, delivering 242 horsepower (180 kW) at 5600 rpm* and 242 lb.-ft. of torque (328 Nm) at 4600 rpm. 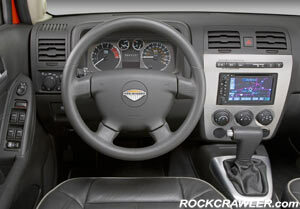 It is backed by a five-speed manual transmission or an available four-speed, electronically controlled automatic. 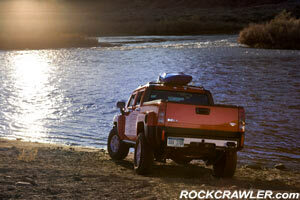 The H3T Alpha’s 5.3L engine is a powerful and efficient member of GM’s legendary small-block V-8 family. It is rated at 300 horsepower (224 kW)* and 320 lb.-ft. of torque (434 Nm). * An aluminum cylinder block is used with the H3 Alpha’s engine. 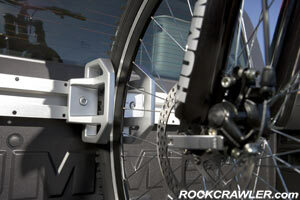 It helps reduce overall mass and maintains a more desirable front-to-rear weight balance. Z85 Heavy-Duty Handling and Trailering – This standard suspension delivers an excellent balance of on-highway comfort and off-road capability. It includes 32-inch all-terrain tires mounted on 16-inch, smoke-color steel wheels, specially tuned heavy-duty shocks and either a 4.56-ratio (3.7L) or 4.10-ratio (5.3L) rear axle. Off-Road Adventure – Designed for more aggressive off-road performance, this optional suspension package includes taller, 33-inch tires, specifically tuned shocks, locking front and rear differentials, 4.03:1 low-range gearing in the transfer case and industry-leading crawl ratios of either 68.9 with the manual transmission or 56.2 with the automatic. To support the torque output of the 5.3L V-8, the H3T Alpha’s front differential case is made of cast iron; other models feature an aluminum case. 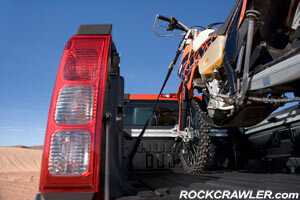 V-8-powered vehicles also receive higher torsion bar rates to support the increased mass and specific shock valving. 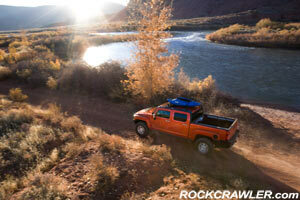 The chassis and suspensions were validated in real-world testing on off-road trails in Moab, Utah; the Rubicon Trail in California, and other challenging off-road venues. Complementing the features that enable the H3T’s impressive off-road prowess is a host of first-class protective elements, including four standard skid shields: a front shield, an oil-pan shield/front-axle shield, a transfer case shield and a fuel tank shield. 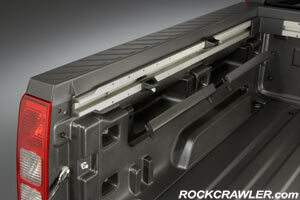 The H3T was also designed for vehicle-to-vehicle compatibility in the event of a crash and its rigid body structure provides good passenger protection. 16-inch x 7.5-inch steel std. ; 16-inch x 7.5-inch aluminum opt.